Parc Oasis is a30-minute bus ride to most International Schools and to the city, Orchard Road. Sited between Jurong East Avenue 1 and Boon Lay Way at their junctions with Jurong Town Hall Road, it is approximately 19 km from the city centre. The Chinese Garden is sited just next to the development. Marketing and shopping facilities are available within the HDB Jurong East New Town where the Jurong East Community Library is also located, and within the other nearby HDB estates. The Chinese Garden MRT Station is located directly opposite the subject development, across Boon Lay Way. The Ayer Rajah and Pan Island Expressways are within close reach. Location is very accessible and within minutes to MRT, bus stops. Excellent security and serene environment. Friendly neighbors and plenty of outdoor space within the condominium. 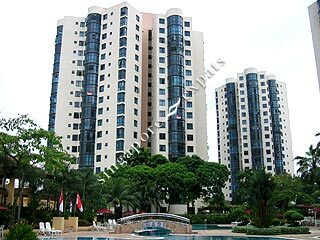 Condominium apartment within the popular Jurong Lake District with all the essential amenities at your easy reach. Great for Asian Expat. Very convenient with travel and easy access. Very spacious and relax environment. Located at jurong central. Next to Canadian international school. Beautiful chinese garden just next to you. Parc Oasis has full facilities, which includes Golf Driving Range, Basement car park, 24 hours security, swimming pool, BBQ pits, gym, tennis and squash courts, jogging track, putting green, sauna, clubhouse, and playground. Parc Oasis is located just a short walk away from Chinese Garden train station and numerous bus services. There are also many schools sprawled across the area, within reasonable driving distance. If you want a place at Jurong, This is it. Near to MRT, easy access to 4 bust stops, close to schools and a very good place to live.